Two organizations partner to perform a Protective Value Study that will quantify the value of MIB's Underwriting Services for Group Voluntary life insurance products sold through the worksite. We’re delighted to be working with LOGiQ³ and Eckler on the creation of this Protective Value Study,” continued Detwiler. MIB anticipates publishing the results of this Protective Value Study on Group Voluntary life insurance products in late 2013. 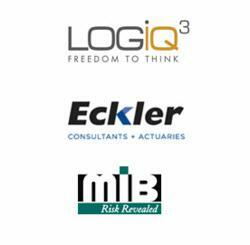 MIB Group, Inc. is engaging LOGiQ³, an expert provider of life insurance and reinsurance consulting and outsourced services (http://www.logiq3.com) and Eckler Ltd., a consulting and actuarial firm based in Toronto (http://www.eckler.ca) to perform a Protective Value Study that will quantify the value of MIB’s Underwriting Services for Group Voluntary life insurance products sold through the worksite. MIB periodically engages independent, third-party experts to conduct Protective Value Studies providing an impartial assessment of the value of MIB’s Underwriting Services in key market segments for the benefit of its 450 life and health insurance members and the North American industry at large. Each study targets a specific line of business, product type, distribution channel, and/or underwriting paradigm providing insight on the return of investment (ROI) insurers can expect by incorporating MIB into their risk selection process. Previous studies conducted on fully underwritten life and health insurance products showed MIB’s protective value at a nearly $50:1 ROI. A 2012 study conducted on a simplified issue life insurance product showed an ROI of $30:1, with protective value extending to face amounts as low as $3,600. “We’re delighted to be working with LOGiQ³ and Eckler on the creation of this Protective Value Study,” continued Detwiler. MIB anticipates publishing the results of this Protective Value Study on Group Voluntary life insurance products in late 2013, and plans to share the study results with the industry (as they have in the past) through an article in the trade press. All parties involved in this partnership maintain unique expertise and competencies and are highly committed to deliver a risk-based approach Protective Value Study to the group insurance market specific to the voluntary segment. LOGiQ³ is the expert provider of life insurance and reinsurance consulting and outsourced services. LOGiQ³ delivers long-term strategic solutions and short-term tactical support across Underwriting, Reinsurance Administration, Claims and Audit. LOGiQ³ supports clients across the life insurance service chain from agent to retrocessionaire from its offices in Toronto, Canada, and Cardiff, UK (http://www.logiq3.com). Eckler is owned and operated by its active principals. It is the largest actuarial consulting firm with respect to both life and non-life insurance in Canada and in the English-speaking Caribbean. Eckler has a tradition of leadership in the actuarial profession and in the benefits industry. Our consultants are involved in the committee work and governance of various national and international professional organizations. We believe that the special insight we gain through these activities gives a competitive edge to our client services (http://www.eckler.ca). MIB is the life and health insurance industry’s most trusted resource for underwriting information and analytical services. Owned by the industry it has served for more than a century, MIB is uniquely positioned to aggregate industry insights in order to develop products and services for its members that improve their risk management decisions. MIB, Inc. and MIB Solutions, Inc. are wholly-owned subsidiaries of the MIB Group, Inc. (http://www.mibgroup.com).